Richard Paige — Leave it to a father and son to bring a little emotion into the 2019 IAWM Leadership Breakfast. After spirited presentations from Derrin Slack ’10, Tom Hiatt ’70, Wabash President Greg Hess, and Andrea Pactor, the audience of more than 220 turned its attention to the final piece of the program: the Indianapolis Association of Wabash Men’s presentation of its Man-of-the-Year award to Dr. Don Shelbourne ’72. Long an innovator when it comes to knee reconstructions, Don began his orthopaedic sports medicine career in 1982. A standout football player and wrestler for the Little Giants, he became interested in sports medicine after tearing his anterior cruciate ligament while in college. Because of that injury, his practice, the Shelbourne Knee Center, focuses on the treatment, rehabilitation, and research of ACL injuries. 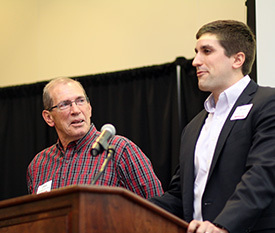 Dr. Don Shelbourne ’72 (left) looks on as his son, Brian ’12, introduces him as the IAWM Man of the Year. In the nearly four decades since, Don has seen a research department and database for evaluating outcomes grow after more than 6,500 surgeries. Such follow-up has allowed him to identify problems with treatment and the factors associated with optimum long-term outcomes. His efforts have advanced ACL rehabilitation to the point where results – returning patients to athletic activities quickly – are predictable and successful. When Don stepped to the podium on March 21, the introduction was anything but usual. His son Brian ’12, himself a standout Wabash basketball player, delivered a heartfelt description of a father, friend, mentor, and surgeon that ran the gamut from funny to emotional. Together on that stage, the Shelbournes leaned on each other as Brian spoke. A well-timed joke to head off tears, a knowing glance, a needed squeeze of the shoulders. All of it shared and needed in the description of a worthy recipient. The impact of the moment wasn’t lost on Brian. 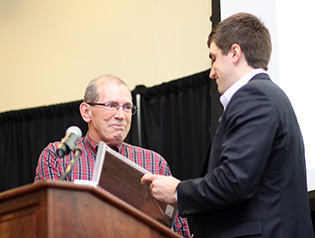 Shelbourne receives the award from his son, Brian (right). During the speech, Brian mentioned that his father was passionate about several things…his family, his work, and Wabash College chief among them. Those in attendance were pleased to have shared in the moment, too.